Chad Haney’s race suspensions have been lowered from six to four. Both are suspended from NASCAR until Nov. 3 and are on probation until Dec. 31. The loss of 150 championship owner and driver points remains intact. The No. 33 car was penalized by NASCAR on Sept. 22 as a result of rule infractions discovered during post-race inspection at the NASCAR Research and Development Center following the Sept. 19 race at New Hampshire Motor Speedway. 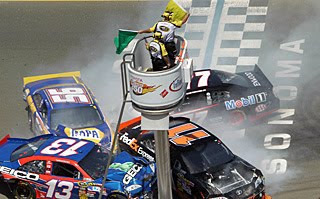 Specifically, the car body location specifications in reference to the certified chassis did not meet NASCAR-approved specifications of the 2010 NASCAR Rule Book.